Very few people match the measurements of mass-produced clothing. You have undoubtedly observed that sizing varies wildly from manufacturer to manufacturer, but blamed yourself for not being able to find clothes that fit you perfectly. Read on, and you’ll realize that you’re lucky when anything comes close. So manufacturers typically use one measurement (usually bust size) and a proportional model (typically the hourglass figure) that are then scaled to establish a whole range of sizes. The hourglass model is on an odd choice, given that fewer than 10% of women actually have hourglass figures — and that may be why some manufacturers tweak the measurements of the proportional model to approximate something that is more realistic or, for the aesthetes, more ideal. Adding to the chaos, the actual start value of the baseline measurement will vary from manufacturer to manufacturer which means that one manufacturer’s 2 will be another manufacturer’s 6. So, no more chiding yourself when you find that nothing fits well in the dressing room. You may blame yourself for climate change and every disappointment your child has ever experienced, but on this you are blameless! Now that you’re feeling better, I’m going to lay the bad news on you: You can only be well-dressed if your clothes fit properly. Since I just told you that your clothes are rarely going to fit properly straight off the rack – and your mind is moving faster than your eyes — you’ve already realized that your clothes will only fit if they are tailored. How do you know if your clothes fit properly? Most people are well aware if something is too tight or too long. More challenging is determining whether a garment is too big and how it can be fixed. I pay particular attention to the way dresses, jackets and blouses fit through the neck, shoulders and torso. Jackets and dresses should lay flat against the back of the neck. Depending on the cut and construction of the garment, the cost of tailoring can be modest or pricey. The seam that attaches the sleeves to the shoulder should sit at or near the joining of the bones that make the shoulder joint. Resetting a sleeve to narrow the shoulders is not always possible, and it is always expensive. For sleeveless dresses and tops, armscyes (also called armholes) should lie flat against the torso and cover undergarments. Taking-in a blouse or dress to tighten the armhole (which can be done on the side seams or the shoulder seams, depending on the garment) is not too costly. Most of my sleeveless dresses and blouses have been tailored in this way. Adding small vents side vents at the hem of blouses that are cut straight up-and-down: This is very easy for a tailor to do and will give the blouse a little movement while preventing it from looking lumpy around the mid-section. Shortening the length of a blouse or reshaping the hem: This, too, is easy but ensures that the blouse is the right length for your proportions and purposes. 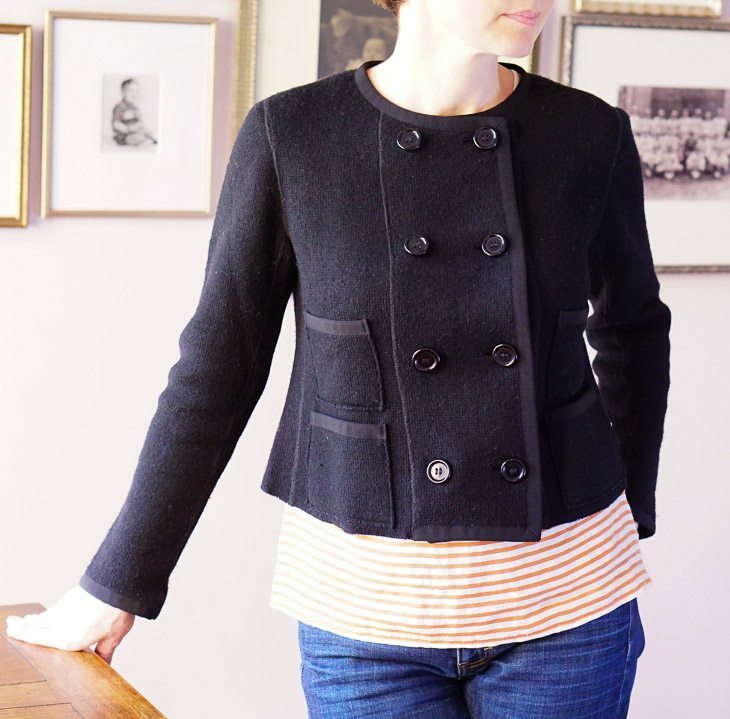 I like the hem of my blouses peeking out from my jackets and sweaters, but sometimes I will want a more classic look and therefore have a blouse shortened to match the length of a particular jacket. I am not a huge fan of shirt-tail hems and have occasionally asked my tailor to make a shirt-tail hem less extreme. For some excellent guidance on these points, and many more, read the Tips & Tailoring advice offered on Alterations Needed. Don’t let the prospect of alterations deter you from buying clothes. Like many daunting problems, the only way out is through! But do take a moment to assess the feasibility of the alterations needed before you make an irreversible commitment. If you want to know more about the history and challenges of sizing standardization check out these quick reads: A Size 2 Is a Size 2 Is a Size 8 by Julia Felsenthal in Slate and Plus-Size Wars by Ginia Bellafonte in the New York Times. And if you are looking for excellent tailors in Washington, D.C., I can recommend two: Bespoke Design at Metro Center (1100 New York Avenue NW) and European Custom Tailors in Cleveland Park (3432 Connecticut Avenue NW). Because tailoring is expensive — tailors are talented craftspeople — you should get a cost estimate before the work commences.